Amy is on vacation on a plane returning from vacation, so her F(r)iends continue to cover. I’m gonna ramble at ya for a bit, themelessly. Not much stumped me this Saturday, although I found the NE the toughest to grok. Just couldn’t see OIL TOWNS for [12d: Houston and Dallas, historically] — wanted NFL TOWNS or something equally ridonkulous. Nice stagger stack in the center, though I wasn’t associating Blarney in [30a: Blarney stone?] necessarily with FAUX — Wiktionary tells me it means something more like “mindless chatter.” So that makes at least two compound nouns where I knew the second term but not the first. Also, what’s up with appending US to NAVY SEAL? Do other countries’ navies have seals? I am the very model of a modern major pinniped! Seems redundant, but I spose it gives the needed length to round out that triple stack in the SE. Q: What did the Buddhist monk say at the [34a: Simple business, frankly speaking? ]: HOT DOG STAND? Was it Friedrich or Kurt who sang [15a: Repetitive farewell from “The Sound of Music”]: ADIEU ADIEU to yieu and yieu and yieu? The Von Trapp family settled in Vermont, not far from me (or from Fiend colleague Dave) and have for many years run a beautiful ski lodge near Stowe. You can eat dinner there and order schnitzel with noodles as you enjoy the LOCAL COLOR. They even brew a HELLUVA excellent beer. 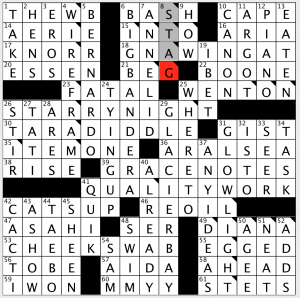 Alternate clue for 9d — [Chevy subcompact abstains]: GEO DESISTS. You know what really brings out the Sanctimommies? [1a: Alternatives to strollers]: BABY SLINGS. Show up at your baby group with an old fashioned Baby Bjorn or with your kid in its car seat because that’s the only place she’d sleep for like months or whatever, and you’ll hear a lecture from people who don’t have anything better to do with their time than tell you what you should be doing with your life and your baby. You’d think anyone not wearing an organic woven boba kango blahblah hoppa doodoo is setting the kid up for MOMMY and DADDY ISSUES for life. Theme: Rhymes involving major corporations. 53a [Staff doctor for a British conglomerate?] VIRGIN SURGEON. Really? What kind of workplace safety procedures do they have if they need a surgeon on hand?! 62a [Quaint shuttle for a hotel chain?] MARRIOTT CHARIOT. Hmm. These don’t quite rhyme for me. 108a [Risky venture by a soup company?] CAMPBELL GAMBLE. I like this one. 73d [Dance club on a networking company’s campus?] CISCO DISCO. My favorite. Of course, I grew up in the Silicon Valley. I am currently on holiday, and frankly, want to be away from my computer. Unfortunately for me, no one else was able to cover this puzzle, so this will have to do. The theme is fairly standard. Nothing too exciting, but nothing off-kilter. 3.3 stars. Your word of the day is NUMBLES (85d, [Edible entrails, as of deer]). Discuss. I think I am getting tired. Almost ten minutes to solve this one! 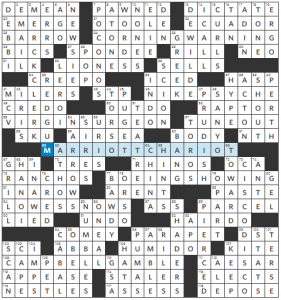 Our good buddy Samuel Donaldson has today’s LAT, and I struggled with this one. I think I need to go on a trip! Next weekend, I plan on visiting family in Kentucky, so it will be a nice weekend getaway to hopefully at least partially recharge the batteries. But I digress: Sam has made a great puzzle. 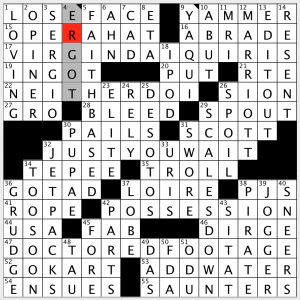 68 words in a wide open grid; no wonder it played slightly tough! I try and pay attention to word count on Saturdays, and the count has been 70 or 72 in recent weeks. A solid 4.7 stars today for a gem. 17A [Soft drinks with lime juice] VIRGIN DAIQUIRIS – Excellent 15 letter entry. All those goofy letters gave me fits. 22A [“Likewise no”] “NEITHER DO I” – Awesome. Unsurprisingly no NYT hits for this one. 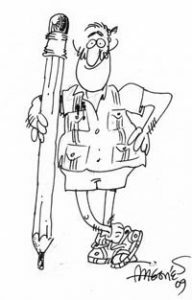 32A [“I’ll have the last laugh!”] “JUST YOU WAIT!” – Another great casual phrase. 1D [Member of TLC] LOVING – I’ll admit: I was going through the names of the R & B trio! 5D [Like some private school curricula] FAITH-BASED – Totally didn’t expect this answer. Couldn’t get off the “college prep” idea. 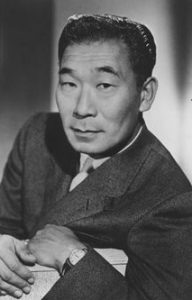 6D [Philip __, first Asian-American film actor with a Hollywood Walk of Fame star] AHN – For some reason I remembered this name, but I couldn’t remember what he was in. After looking it up, he was in everything! I think I may remember him best from the old Kung Fu TV series. 9D [Arizona people] YAQUI – Wow! This one was tough. I don’t think I have ever seen this tribe name. 12D [Omni alternative] MARRIOTT – This makes more sense than my first guess, THE HYATT! I am now hoping these live solves on Twitch using downs only are a regular thing. I have not heard if there is one this weekend, but I will be scouring Twitter to see if I can find out. Or I can just ask Erik Agard; he should know! I thought last week would give Andy Kravis fits, but he put on a solving clinic that, if you can find the video of, you NEED to watch. I would think a downs only solve on this Longo puzzle would ALSO cause major fits. But maybe it only caused ME major fits! If you hear of a live solve of this puzzle, please let ME know! Yes, this took me a full 30 minutes, and you see all of the second-guessing marks in the grid! Another great Longo gem, this one is. 4.8 stars. 1A [Broadcast network shuttered in 2006] THE WB – This did not come to my consciousness fast enough. In my defense, it WAS twelve years ago! 17A [Big name in little cubes] KNORR – As in bouillon cubes! I had RUBIK in here quickly; that’s a good guess! 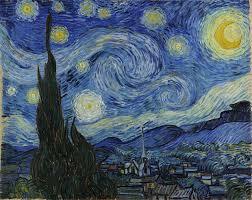 26A [Inspiration for some wished] STARRY NIGHT – Also a famous painting, but that probably would have been too easy! 30A [Minor misstatement] TARADIDDLE – This is one of my favorite words! It sounds so silly! 4D [Common lens holder] WIRE FRAME – This entry especially stands out to me if you are only looking at down clues. It would seem to me this would take some mental gymnastics to come up with. 5D [Name on the “Last Emperor” director Oscar] BERNARDO – As in Bernardo Bertolucci. Yeah, you knew that! 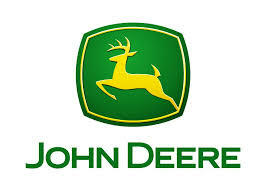 8D [Illustration atop deere.com] STAG – C’mon, Derek! This shouldn’t have been so hard! You live in farm country!! 31D [Short-term illuminator] GLOW LIGHT – Two words? Sure. I had GLOW STICK, which is much more fun! 37D [Query that may precede a flash] ANY IDEAS? – I think this may be my favorite clue. Tough, but fair in the end. 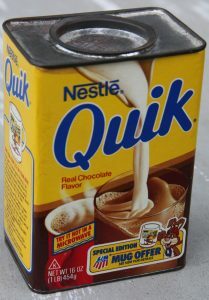 41D [No-wait, in brand names] QUIK – This is making me hungry for some Nestlé Quik chocolate milk! I don’t think you can buy the canister like this anymore! 48D [Have a reeling feeling] SWIM – I sooooo wanted this to be SWAY! This entry was posted in Daily Puzzles and tagged Frank Longo, Julian Thorne, Mike Shenk, Ryan McCarty, Samuel A. Donaldson. Bookmark the permalink. Yes, there are other SEALs (SEa, Air, Land operation teams). The recent rescue of 12 boys from a flooded cave claimed the life of a Thai Navy SEAL. 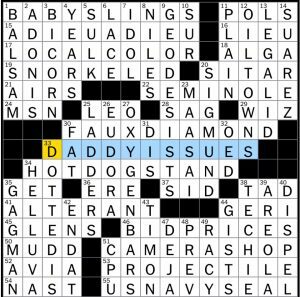 NYT: Liked the puzzle, especially the DADDY ISSUES/SIGMUND combo… And really enjoyed the review by Laura. Truly happy to see a reference to a soccer star in NYT, even one whose on-field behavior has been objectionable at times. That’s a really biting remark. This is the derivation of humble pie via metanalysis. Very interesting. Thanks for that information. For a while I had LOADERS (LADDERS) and LET (FAT) and LOU X DIAMOND (FAUX DIAMOND) which was giving me DEADY ISSUES for parental issues. Re YAQUI in the LAT: I believe the tribe was featured in the Carlos Castaneda books (The Teachings of Don Juan, etc.) about peyote & shamanism, but that’s definitely a 60s/70s thing. Yes, in fact his seminal work is titled “The Teachings of Don Juan: a Yaqui Way of Knowledge.” I really liked it when I first read it, but later learned it is almost certainly a work of fiction, fraudulent passed off as an anthropological case study. Tripped up on 28A, first putting ZAG for SAG since I didn’t know the exact name for a GEO…whatsit. The Stumper wasn’t too stumpery for me this morning. I had RUBIK but thought it probably wasn’t right and switched to KNORR after coming up with BERNARDO. In the NYT I had COWTOWNS before OILTOWNS — and Wikipedia says that Dallas existed as a rail center for the transport of cotton and cows before oil was discovered. “Blarney stone” for FAUXDIAMOND doesn’t seem quite right to me, and the clue for DOTTEDIS was misleading–it’s not as if Hawaii has dotted i’s and other states don’t. BIDPRICES doesn’t sound like an auction term to me. You bid, obviously, and the auctioneer wants to get above the reserve price, but a bid price doesn’t mean anything. Online dictionaries suggest that a bid price is more of a Wall Street term–it’s what you’re willing to pay for some asset or other. Apart from all that, I liked the puzzle! The clue for FAUX_DIAMOND is actually “Blarney stone?” with that all important question mark. In Pinocchio, someone sings “when you wish upon a star.” Although when I was I kid, I was taught to wish on a falling star. WSJ: Anybody else disappointed that “March victim” wasn’t paying respect to Heather Heyer on the anniversary of her death?